JO: Where did you get your formative training in cello? JO: What was different or unique about Rodney’s approach? MF: There was a gang of about thirty of us studying with him at the time, going to group every week, hanging out at Youth Orchestra, tossing footballs during intermission at cello concerts we were playing on. He was just cool, and let us do whatever we wanted to do. He made cello playing seem like everything else, easy, fun, natural. We used video tapes, audio tapes, took cello field trips, made t-shirts, it was like being on The Cello Team. JO: How long did you study with him? MF: And then, between the age of 15 and 17, I went through 10 different teacher changes. It was crazy. I heard, bend the thumb,” “don’t bend the thumb,” “high arm,” ‘low arm,” “up bow,” “down bow.” During this period, I spent two summers at Eastern Music Festival in Greensboro, NC, where I studied with Scott Ballantyne, personal teaching assistant to the late Leonard Rose. Scott, or Schecky, as we called him, basically turned me around in my cello playing, and I began to take it seriously for the first time. 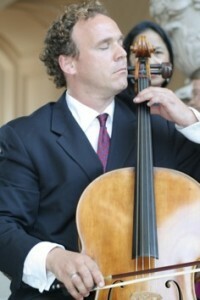 Had I not met him, I probably would not be playing the cello today. He convinced e that I could do it. So when I got back to Kentucky for my senior year in high school, I quit the soccer team, of which I had been captain, practiced, and eventually moved to New York City to study with him. That summer, I played again for Leonard Rose in his master class and performed Lalo Concerto with the Eastern Music Festival Orchestra. JO: Was that your first concerto appearance with orchestra? MF: Yes. Nerve-wracking. To be sure. I’d prepared the concerto for months, but when the day finally came, I felt like I was in a vise. I sat by a tree forty-five minutes before the performance and basically said to myself, “This is it … you’ve got to do this … there’s nothing else.” I went out and played and it was like I was in a dream. The whole thing warp-drived. At one point, I remember looking down at my bow and just seeing it gliding across the string, effortlessly, of its own accord, somehow attached to my arm. JO: Where did you attend college? MF: I went to The Cleveland Institute of Music, where I studied with Alan Harris. I spent two years there, and then went to Northwestern University when he accepted the position there. JO: What was studying with Harris [a former student of Janos Starker] like after having worked with Ballantyne [a former student of Leonard Rose]? MF: The creative freedom Harris helped me develop has been irreplaceable. I learned to think for myself, take risks, feel what I was feeling, believe in my own abilities. I think musically he showed me what it meant to be an artist. It was somehow beyond cello. JO: Do you feel that the Starker approach and the Rose approach are reconcilable in a combined style of cello playing? MF: Absolutely. I believe they meet at the point where Casals left off, which I refer to as “high-energy playing.” It is the best of both worlds, beautiful tone from the bow, accuracy from the left and, all connected by the music of the heart, which Casals certainly showed us. I think that’s our job, as musicians of today, to combine the best of all the traditions. JO: What happened after Northwestern? MF: I went briefly to Yale and eventually ended up back in New York City, studying again with Scott Ballantyne (who coincidentally had filled Alan Harris’ position at The Cleveland Institute when Harris when to Northwestern) and pursuing a Master’s Degree at NYU. JO: What was that like? MF: It was a trip. I played cello in a Greek “bazouki” band at a Greek nightclub, played in a 12-piece group called The Paragon Ragtime Orchestra, did concerts at Merkin Hall, toured with my friend Dan Rieppel as Fitzpatrick-Reippel Duo, played on the radio, played at the Lincoln Center Subway Station for three months, and played solo cello in the back garden at the world-famous Tavern on the Green Restaurant. JO: How do you think those experiences affected the way you interpret and play music now? MF: They changed me forever. I thought I knew something about music, until the first night in the Greek nightclub, when Kostas Gikas, the bazouki layer [the bazouki is a Greek, bell-shaped “banjo” and went off on an improvisation solo for about twenty minutes that just blew my mind. I’d never seen fingers move that fast, heard such sounds, or seen or been that close to anyone singing and playing with so much soul. He played fifteen different instruments, played music twenty hours a day, composed, and reminded me of an old ship captain you’d hear about in ancient tales. He was really the first “MUSICIAN” I’d ever met; he defined the term for me. JO: Then you left New York and moved to Lexington. MF: That’s right. New York had kind of put the spin on me, things moving so fast, and I wanted to get back home and process what I had learned. Well, I wasn’t back in Lexington two weeks when a cello position opened up in The Lexington Philharmonic, a faculty spot opened up at Transylvania University, and Rodney Farrar, still in Lexington but traveling so much that he couldn’t keep teaching, turned his cello class over to me; suddenly, everything was happening. JO: What was that like, going back to the town you’d grown up in, taking over Rodney’s students (your first teacher), playing in the same orchestra with other music teachers whom you had known as a kid? MF: I wasn’t in New York anymore, the pace was different, and I had to learn to slow down. That was the biggest challenge. But it was great, everyone was very supportive, and I had lots of free time to pursue photography, writing, and recording projects I had begun envisioning in New York. It was a time in which I learned how to define my own style. MF: High energy playing. It’s gotta be turned on, it’s gotta be fun, it’s gotta be you. 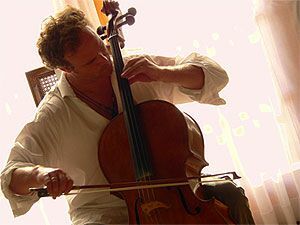 The photographs, the improvisation, the writings, all add to the dimensions of cello playing. As Casals said, “I am first a Man, and then a Musician.” When we are well-rounded as people, that is to say, when we have a balance of things we like to do and are good at, then we can be effective as musicians, as poets, because we have a message, ultimately a message of harmony. This is our challenge, and our call. with the Eastern Music Festival Orchestra. was like I was in a dream. The whole thing warpdrived. feeling, believe in my own abilities. a combined style of cello playing? to combine the best of all the traditions. Visit Michael online at his website. Children become what they are told they are.